Over the past few decades, Boulder County has seen the departure of a lot of farmers, making Keith Bateman’s long-term commitment to farming a notable one. Keith grew up in Lafayette where his grandparents owned a dairy. Until he was 17, Keith farmed alongside his father in fields around Waneka Lake and up and down Baseline Road until his dad decided to get out of farming. 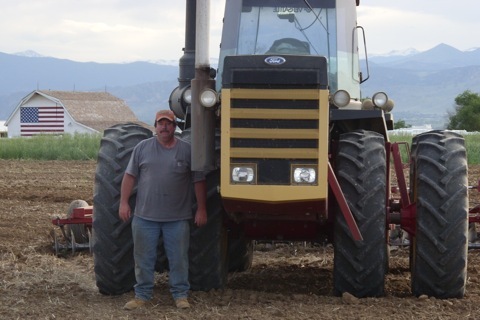 A year later, Keith borrowed $800 to start farming on his own. Today, decades later, Keith is still passionate about the art of farming and being a good neighbor. If you live in a house in Lafayette that is less than thirty years old and located between Indian Peaks golf course and the Lafayette Library off of Baseline, chances are your home sits on land that once was farmed by Keith, his father, his grandfather, his great-grandfather or his great-great-grandfather. Nowadays, Keith farms with his son and, god-willing, Keith’s grandkids will grow up to be the seventh generation of Batemans to farm in and around Lafayette, Louisville and Erie. Each year Keith and his son grow brewing barley for Coors and wheat for bread, as well as corn, alfalfa hay, grass hay, and oats. They also raise about 80 calves. For the first time in 2011, they are growing high-fiber barley – a whole grain that can play a role in healthy diets to help to prevent diabetes, heart disease and obesity. This year Keith looked at adding organic wheat to his repertoire of crops, but he couldn’t find a suitable buyer for his crop. One of Keith’s main crops is dryland wheat. He grows it up and down Highway 52 as well as in Louisville, where he leases a field on the Harney Lastoka Open Space that sits next to the Growing Gardens’ Kerr Garden, the historic farm and the ball fields, just south of the intersection of Highway 42 and South Boulder Road. Keith is well versed in the art of growing dryland wheat and every bit of his artistry goes into that field. He leaves stubble in the field each year to protect the soil from wind erosion and to increase stored soil moisture which leads to healthier, pest resistant wheat plants. Like most Colorado farmers, he uses pesticides judiciously and only as a last resort when the weeds reach a level that threatens the value of his crop. Keith takes extra care when the field on the Harney-Lastoka Open Space must be sprayed. The typical buffer zone for an organic field is about 100 feet, but to protect the organic vegetables in the Kerr Gardens, Keith has expanded the zone to 200 feet. When he needs to resort to herbicides to protect the crop, he brings in a team of experts to help with the job, even though he could do it himself. The team carefully monitors the wind, air temperature, humidity and other factors to precisely adjust the droplet size and spray volume. Their fine attention to detail ensures that they use only the amount of pesticide needed to do the job and not a droplet more. As they work, Keith uses sensitive monitors, called drift cards, near the edges of the field to confirm that no spray gets away. One time he set up a drift card just a few feet from the spraying operation and even there there was no sign that spray was going anywhere other than it’s intended target. You’re likely to see Keith or his son out working in their wheat fields when they are planting the winter wheat sometime between the beginning of September and mid-October. They are back again the following summer to harvest that crop. In between planting and harvesting, Keith regularly monitors his fields to make sure everything is growing as it should. Weather permitting, in a good year Keith and his son grow enough hard red winter wheat to make 435,000 loaves of bread. Learn more about How Wheat Works , a great interactive program from the Wheat Foods Council that provides the full farm-to-fork experience as you plant, harvest, mill and bake a crop of wheat.